Ultrasound has been used therapeutically for many years. 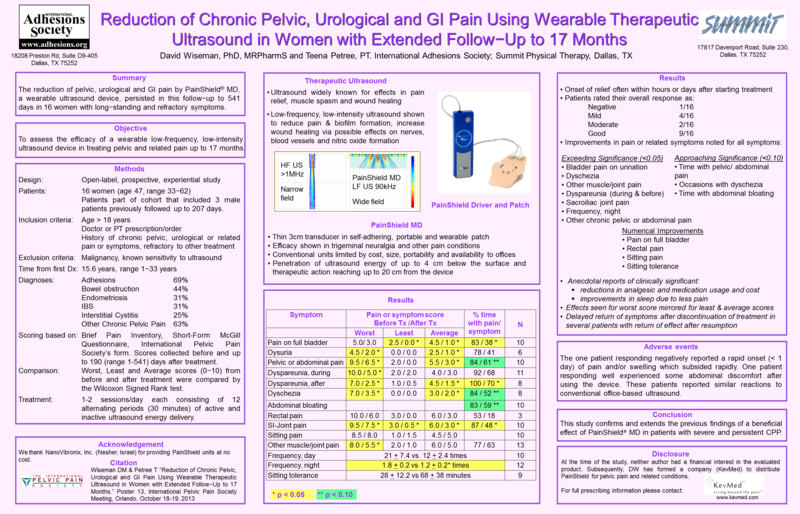 PainShield MD is the first device to treat it with wearable, low intensity, low frequency therapeutic ultrasound. PainShield MD has been used to treat a variety of types of pain or pain associated with the conditions listed below. See the results of our clinical data regarding abdominal, pelvic, urological and GI pain by clicking here. Our own clinical data was initially reported with a follow-up period of up to 207 days, and later reported with a long term follow up of up to 541 days. This is a growing list of types of pain for which patients have reported successful results using PainShield MD. We hope in the future to collect data about these types of pain in the more formal setting of a clinical trial. Please consult with your doctor as to whether PainShield MD is an appropriate treatment for your pain. Please share with your doctor the prescribing information described here.